Nouvinguts, Fins Quan? : La Incorporacio De L Alumnat Estranger No Uvingut Al Curriculum Ordinari (v Simposi Llengua, Educacio Immigracio, Celebrat El 23 I 24 De Novembre De 2006 En Girona) por Vv.aa. On the 23rd and 24th of November 2006 in Girona the V Symposium on Language, Education and Immigration was held, organized jointly by the Institutes of Sciences of the Education of the University of Gerona and of the University of Barcelona and the Foundation 'La Caixa'.nDuring those two days, the nearly three hundred professionals of education from Catalonia, the Balearic Islands, the Basque Country, Valencia and Andorra, were able to reflect and discuss, with the help of the contributors and with the analysis of the experiences and presented papers, on the interrogative sentence that gave name to this edition of the Symposium: Newcomers, until when?nOn this occasion, the Symposium focused on the theoretical reflection and the analysis of experiences on the processes of socialization and of acceleration of the necessary training to allow the full participation of the foreign student body new to the ordinary curriculum in the fastest way possible. 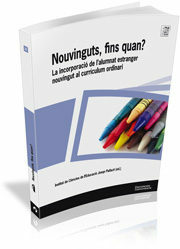 Obtenga el libro de Nouvinguts, Fins Quan? : La Incorporacio De L Alumnat Estranger No Uvingut Al Curriculum Ordinari (v Simposi Llengua, Educacio Immigracio, Celebrat El 23 I 24 De Novembre De 2006 En Girona) en formato PDF o EPUB. Puedes leer cualquier libro en línea o guardarlo en tus dispositivos. Cualquier libro está disponible para descargar sin necesidad de gastar dinero.